Consider cleaning of your gutters in order to save your house from costly damages. 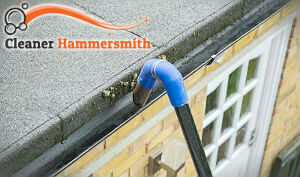 We would be more than glad to provide all the residents in Hammersmith with our expert gutter cleaning services. We specialized in this field for many years, and we had seen a lot of ruined houses thanks to the neglect to the gutters. Our cleaning technicians know the importance of their work and they won’t leave your gutters until they are spotless. We use top detergents, tools and technologies in order to provide you with safety for your home. Benefit from our cost-effective services and save money and unpleasent experience. Your gutters need to be cleaned at least twice a year, before the rainy seasons. Especially in the autumn when the leaves start to fall down, they will find their shelter in your gutters and clog them. To clean the gutters by yourself is not an easy and pleasent job, that’s why we are eager to provide you with our services, spread all around W6. Our cleaning technicians are heavily equipped with the latest technologies and products, so that they will clean absolutely immaculate. We can give you a guarantee that if you are not satisgied with their work, we would be more than glad to re-clean. You are about to start the deep seasonal cleaning? We would like to remind you of your gutters, because this can save you a lot of money. 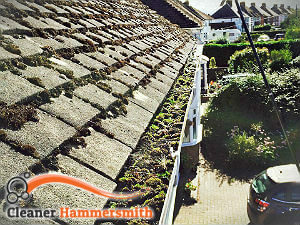 If you live in Hammersmith, let our gutter team take this heavy task off your hands and provide you with impeccable clean gutters. By using our gutter cleaning services, you will ensure with long-lasting effect and next time the cleaning will be a lot easier. Our prices are fair and if you decide to join the list of our satisfied existing customers, you will be rewarded for your trust with a lot of discounts. Get in touch with us and we will respond to your needs.